It's known as the "honey shot" - when a conventionally attractive woman is picked out of the crowd by cameras at a sporting event. The issue has come under scrutiny during this World Cup and Fifa has said broadcasters have got to stop zooming in on "hot women". It happened to Natalia Betancourt at the 2014 World Cup game between Colombia and Brazil. Those few seconds on screen would launch a career in modelling and on TV. "I had no idea the cameras would zoom on me," she tells BBC 100 Women. "And of course, I had no idea how it would all grow from there." Her image was noticed by the singer Rihanna, who shared a picture of Natalia in the crowd, captioning it "Colombian cutie". "It was a fun moment, but I thought that was it - a few seconds of fame and a nice Twitter interaction with a pop star I admire." When Natalia returned to Colombia from the tournament in Brazil, she wasn't prepared for what would happen next. "That image opened the doors of the media for me," she explains. "I had nothing to do with that world before, I owned a construction supplies company with my boyfriend." Within months, she was on the front cover of men's magazines. "I took part in the Colombian edition of the reality TV show Dancing with the Stars," says Natalia. "That was a game changer; afterwards I became more comfortable and relaxed being in the media." She's since worked with a number of Colombian brands and now models for an international hair care company. "I still have the construction company with my boyfriend. Yes, the same guy that went with me to the 2014 World Cup - we have been together 13 years." The high of being picked out of the crowd was followed by the low of the almost inevitable social media backlash. "The nice comments were always more numerous, but I found it hard to ignore those that hurt," she says. Just this week, Fifa's diversity boss has said broadcasters have been told to stop zooming in on "hot women" in the crowd at football matches. "We've done it with individual broadcasters. We've done it with our host broadcast services," said Federico Addiechi. The gallery was later removed by Getty, who said that it was a "regrettable error in judgement". The honey shot is not a new phenomenon. US sports television director Andy Sidaris is usually credited with its invention, saying: "Once you've seen one huddle you've seen them all. "So you either look at the popcorn, the guys, or the ladies. The choice is clear to me." Fifa said it has been working with the local organisers and Russian police to identify and punish abusive fans. Meanwhile online community This Fan Girl has produced a collection of photographs that represent the "different kinds of women" who go to matches. 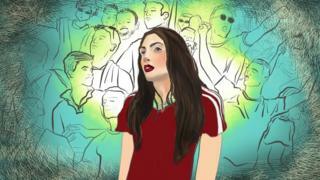 "I have always been a football fan," says Natalia. "I love going to matches and I love the atmosphere of a World Cup. Brazil was my first World Cup but after that I promised I wouldn't miss one." Other women have also made a career after featuring in a honey shot, most notably Pamela Anderson, who was picked out of the crowd by cameras at a football game in Canada. "I did not know what a honey shot was," Natalia says. "I don't think it's offensive or objectifying. I think in a way it's good that it shows that football is a sport for both women and men." Natalia's honey shot story doesn't end there. She travelled to Russia a few weeks ago, for her second World Cup tournament. "I got zoomed in on during the Colombia vs England match, which I think was hilarious," she says. "In Brazil I was all smiles and excitement, this time I looked worried and sad on camera - it was right after England had kicked us out of the World Cup."